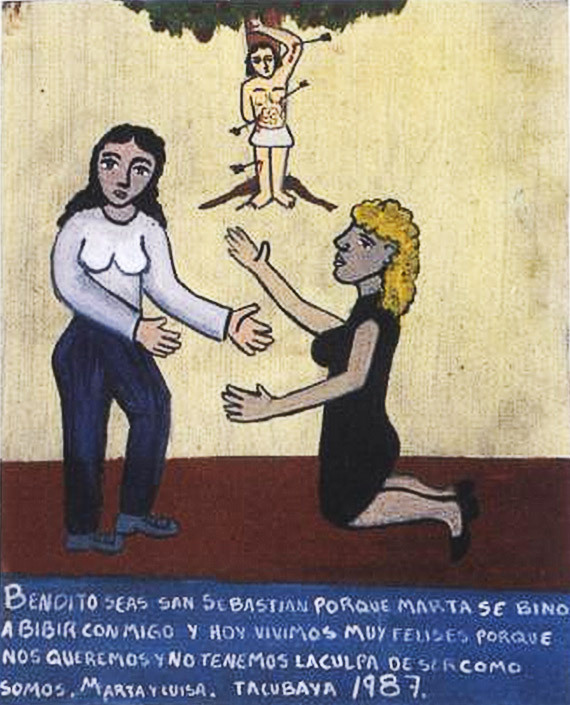 May you be blessed, Saint Sebastian, because Marta came to live with me. We are happy together because we love each other very much and aren’t afraid to be who we are. 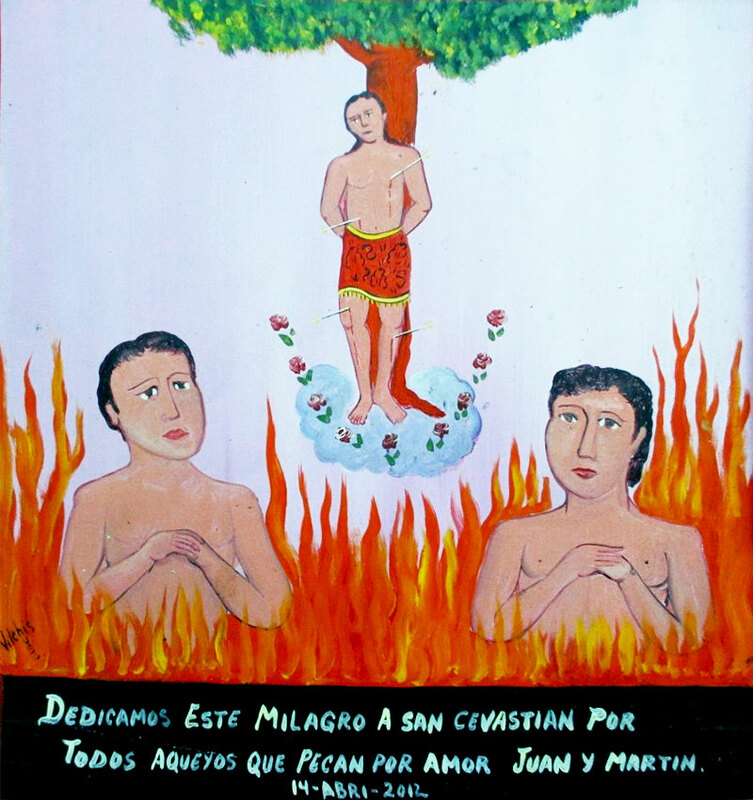 Saint Sebastian, we offer you this retablo about our love which was a secret. Now we can scream out loud about it because we got married and are very happy. We thank for being made for each other. One night, after leaving work I went to a bar with my colleagues and drank nonstop. There I met a stunning woman whom I invited to a hotel. I was very excited for being able to score her. I give infinite thanks to Saint Sebastian because, although I was pretty drunk, I realized—before spending a night together—that it was a man dressed like a woman. I promise to be more careful when I’m having fun. 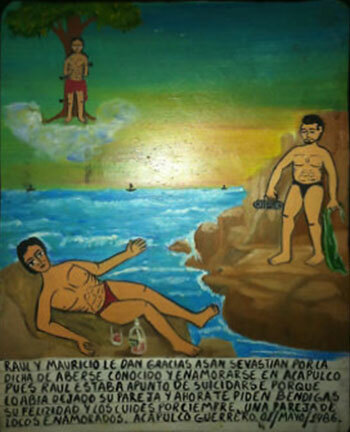 Blessed you may be Saint Sebastian for the miracle that Paco returned to me after he had dumped me for a woman. Today we are enjoying our love here in Acapulco. I was unemployed and saw an ad requiring masseuses in a spa for ladies. I had an idea to dress up like a woman and to ask for this job. 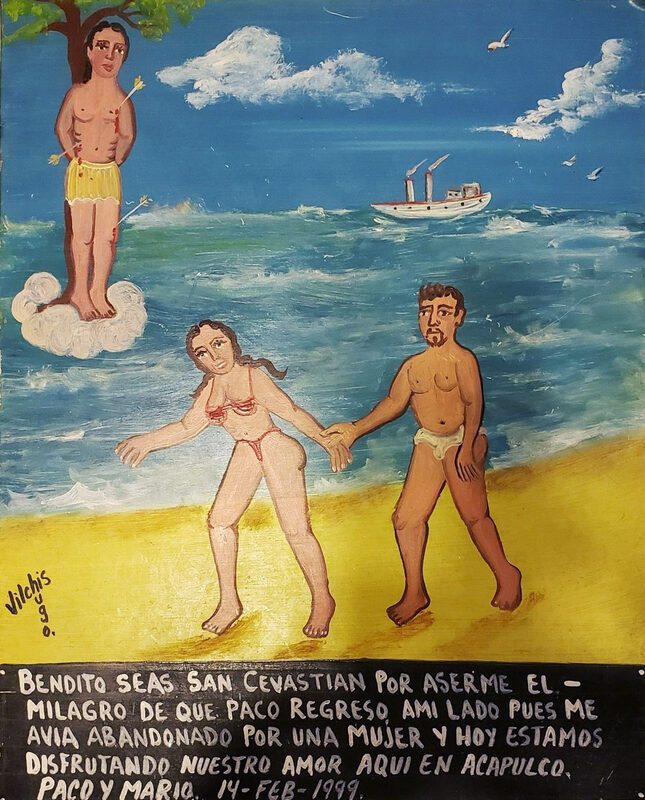 I thank Saint Sebastian with the present retablo because nobody noticed that I’m a man and I’m keeping this job, which, apart from having an excellent salary, allows me to check out the clients without clothes. Saint Sebastian, may you be blessed because Jesus forgave me for not saying him that I’m a transsexual. He is back, even we would never have children. I, Maria, give thanks to Saint Sebastian because now I’m feeling better. I was beaten by two men after I refused to go in the hotel with them. Thank you, Saint Sebastian, for helping us in our relationship. It’s tough because our families are against our love. 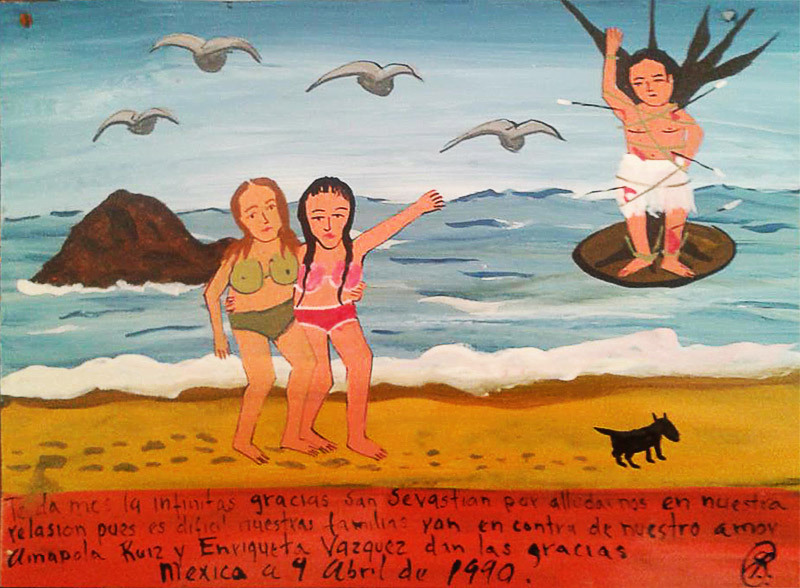 Amapola Ruiz and Enriqueta Vazquez give thanks. 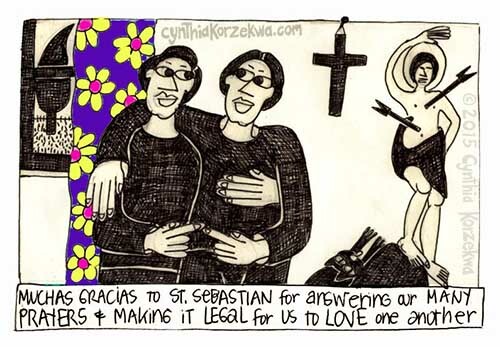 Muchas gracias to St. Sebastian for answering our many prayers and making it legal for us to love one another. Saint Sebastian, thank you because my father finally understood and accepted my sexuality. He let me live my life and blessed me.I understand him since I’m his only son, but it’s not my fault that I was born as I am. It’s my fate and I couldn’t do anything. 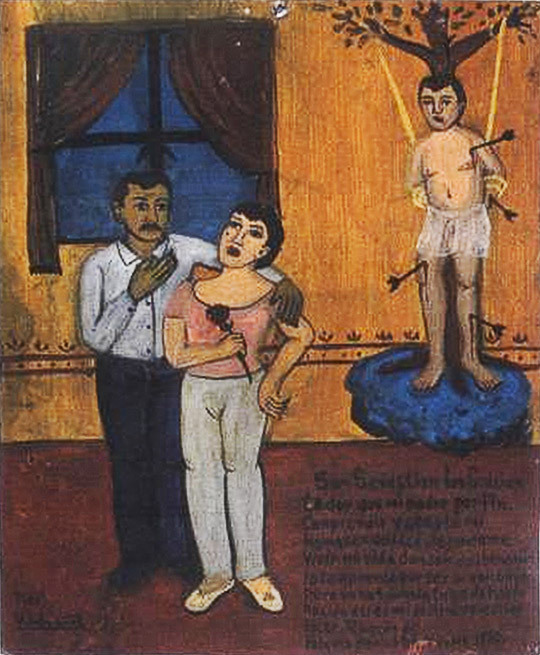 We delicate this retablo to Saint Sebastian for those who sin for love.